Capterra surveyed users of learning management systems (LMS) to learn all about how people buy and use this software. What we found will knock your socks off. Learning management software, also known as eLearning software or online learning software, makes computer-based learning and education easier for trainers, teachers, and HR professionals. It's a $2.5 billion industry on the corporate side alone, and The combined corporate and academic LMS market is predicted to grow to at least $7.8 billion by 2018.Tweet Thisthe combined corporate and academic LMS market is predicted to grow to at least $7.8 billion by 2018. LMS is predicted to revolutionize both the way we learn as students and the way we learn on the job. As one of the most far-reaching and impactful types of business software in the 21st century, it's important to understand how the technology is currently working, and where LMS software could stand to improve in the years ahead. Which is why we surveyed LMS users to get an integrated picture of just how people are finding, buying, and using learning management systems. The results of this LMS study provide valuable insights regardless of what side of the industry you fall on—buyer, user, learner, or vendor. 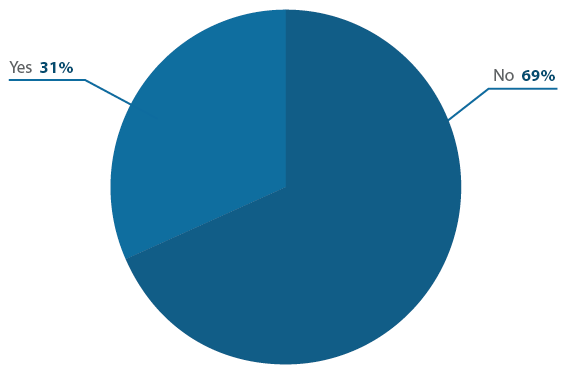 87% of respondents use a web-based LMS, while only 13% have an on-premise or installed system. 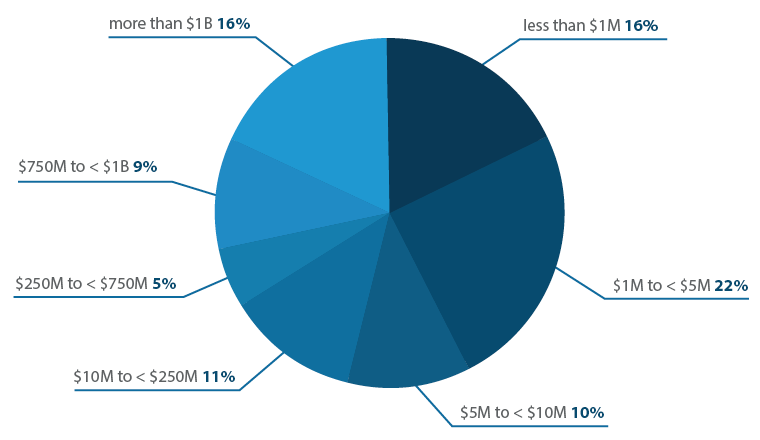 People spend 59% more than they expect to on their LMS (the average annual spend is $70,614). Live/video conferencing tops the list of most desired features lacking in current LMSs. LMSs have the greatest impact on overall cost of training, according to respondents. 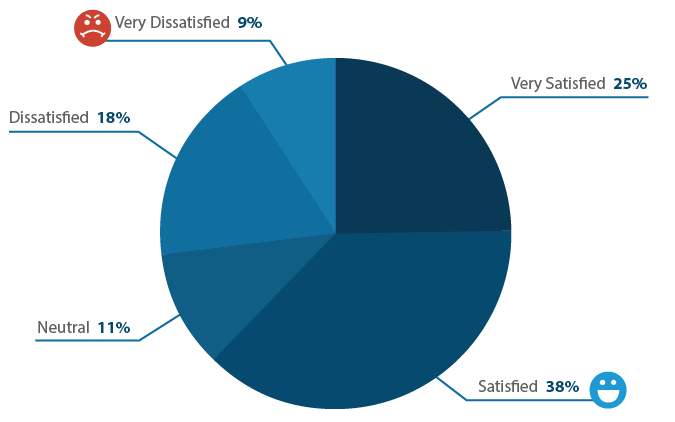 26% of people are dissatisfied or very dissatisfied with their current LMS. We've packed this LMS report chock full of easily digestible, useful information, such as the LMS features that users desire most (and the ones they use the least), how well pre-purchase cost expectations match up with reality, and revelations on implementation time and search time. The types of organizations using learning management systems break down broadly between academic/educational institutions and companies that use them for training, onboarding employees, or selling courses. 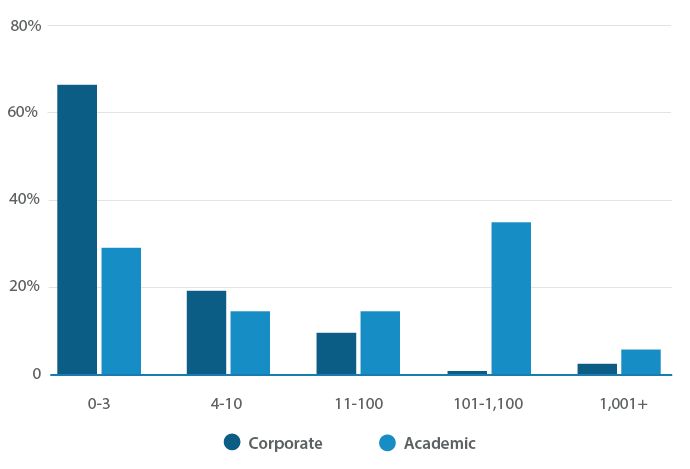 This breakdown is a little lopsided, with academic organizations making up around a fifth of all LMS users (21%), and a mixture of other industries, from advertising/marketing firms, to financial services, and membership associations, comprising the rest. Of this group, the largest share is technology companies, at about 12% of all respondents. Given the comfort technology companies have already doing many things digitally, it's not surprising a large number of them also handle training and onboarding with software. Following technology firms are manufacturing companies (9%), consulting firms, and medical organizations (both at 7%). While many consulting firms help clients with training, onboarding, and certifications, the likely explanation for (relatively) heavy LMS use in the manufacturing and healthcare sectors is both the complexity of their work, as well as a heavy compliance and regulatory burden which automated student tracking can alleviate. 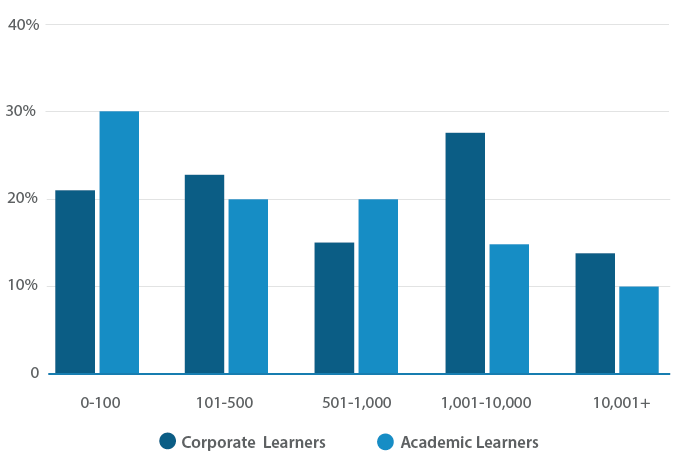 In a somewhat surprising reverse bell curve, organizations on both the lower and higher ends of the revenue spectrum use learning management systems more than those in the middle. This may represent the old guard users—large, academic or corporate institutions with millions to spend on comprehensive LMS products—meeting the new guard users comprised of smaller startups and tech firms taking advantage of lower cost cloud and SaaS options. It could also be that small companies are serving the midsized players with outsourced training, obviating their need to use LMS software in-house. 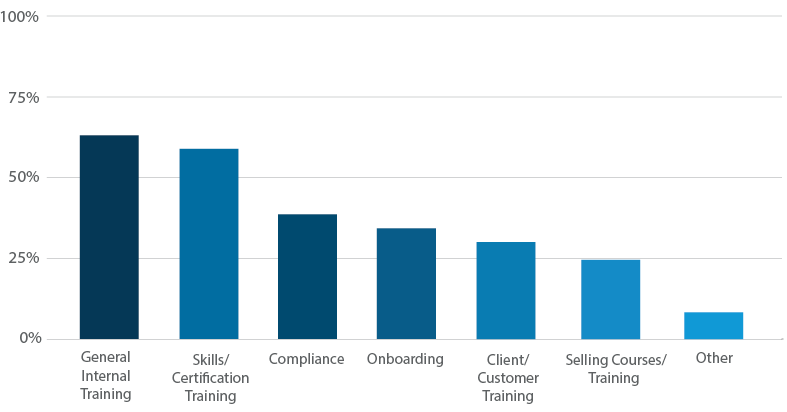 The most common roles among buyers of LMSs were company founders and owners, consultants, and internally-focused positions like instructional designers and training managers. This set of data is broken out for academic versus corporate organizations, as both have different definitions of users and learners. 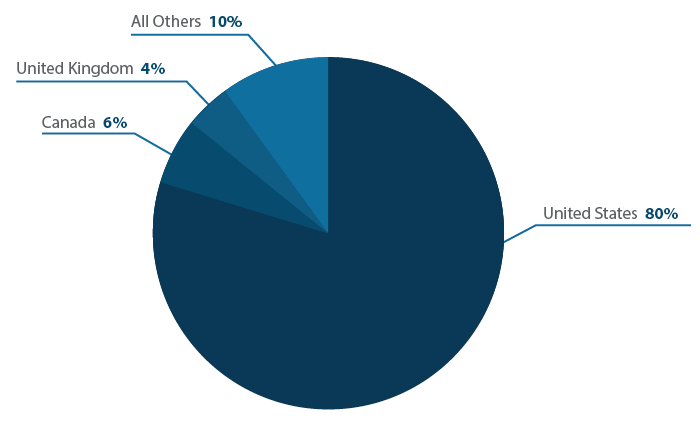 In this LMS survey we found a wide range in the numbers of users for an LMS, from five, all the way up to 600,000. The breakdown of administrative users shows academic institutions employing, in general, more users than corporate ones, reflecting perhaps the participation of teachers as well as administrative staff in eLearning programs. What LMS do they use? The most popular LMSs among respondents track very well with our previously published research on the subject. 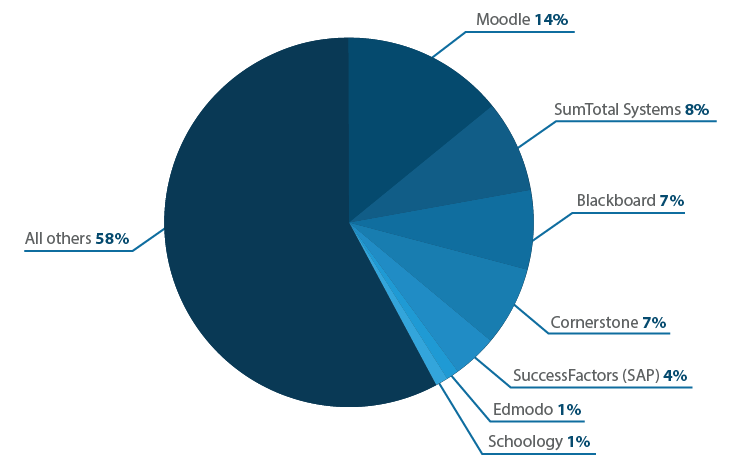 Moodle was far-and-away the most used, with SumTotal/Skillsoft a close second, and Blackboard and Cornerstone vying for third. Which LMS software are you currently using? The wide range of different LMSs represented is representative of the hundreds of learning management systems on the market. From open source solutions like Dokeos, to large enterprise tools like Taleo Learn, and with several organizations using custom options, it seems clear the LMS market is not a monolithic, consolidated one (despite recent bankruptcies and acquisitions). Is your LMS web-based or on-premise? The world is moving into the cloud, and the learning management industry is no different.Tweet This The world is moving into the cloud, and the learning management industry is no different. Fully 87% of respondents use a web-based LMS, while only 13% have an on-premise or installed system. This may partly explain the somewhat surprising number of smaller organizations using what were, traditionally, capital intensive learning management systems. How did they select their LMS? The research, selection, and buying process for learning management software can be difficult, with whole LMS buying guides designed around helping you navigate it. We think the following insights from buyers can shed even more light on the process. Were you using a different LMS before purchasing your current software? Over two thirds of LMS buyers are new, or “first generation,” purchasers.Over two thirds of LMS buyers are new, or “first generation,” purchasers.Tweet This This data suggests not only that the demand for learning management systems is growing, but also that LMS software providers are doing a decent job of keeping existing customers. 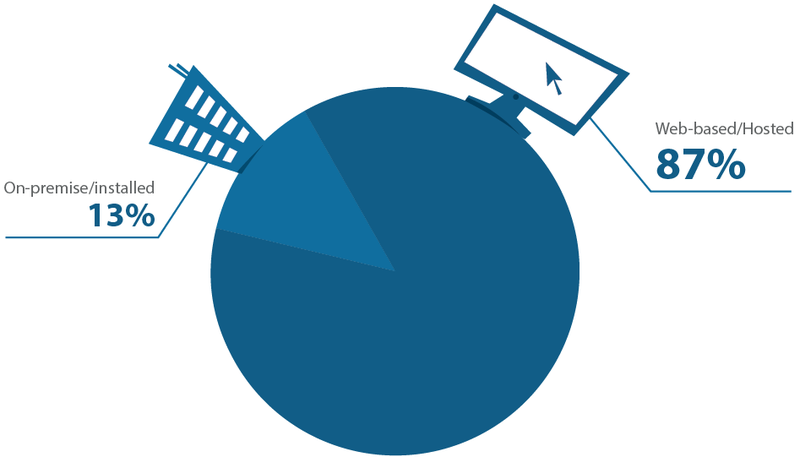 Only 31% of LMS buyers switched from a previous system. Of these, the vast majority (66%) did so because their previous LMS didn't have all the features they required, indicating Buyers are seeking more customizable and feature-rich solutions.Tweet Thisbuyers are seeking more customizable and feature-rich solutions. Somewhat surprisingly, only a scant 6% of people switching did so because of cost, with many more people switching because of ease-of-use (22%), lack of support (28%), or organizational growth (13%). 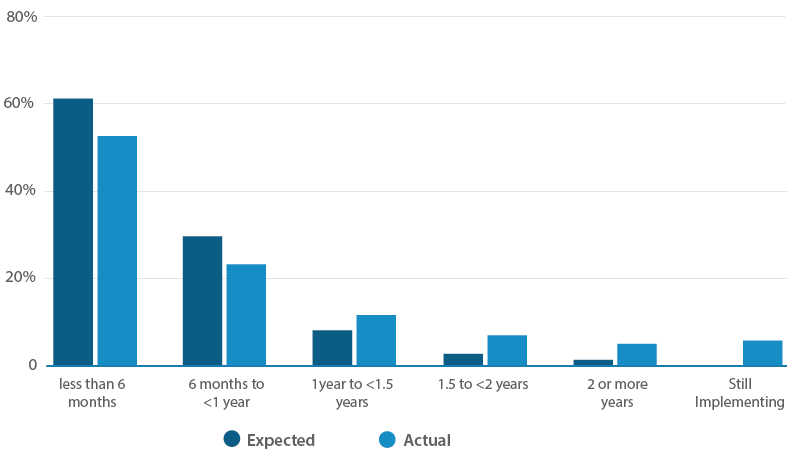 How long in months did you expect to spend searching for your LMS (from research to final purchase)? Before embarking on the purchase process for their LMS, buyers tended to be optimistic, with the most people (36%) assuming the search phase would only take three months. 69% of respondents assumed they would be done within six months. Only 6% of people thought it would take over a year to complete their LMS search. 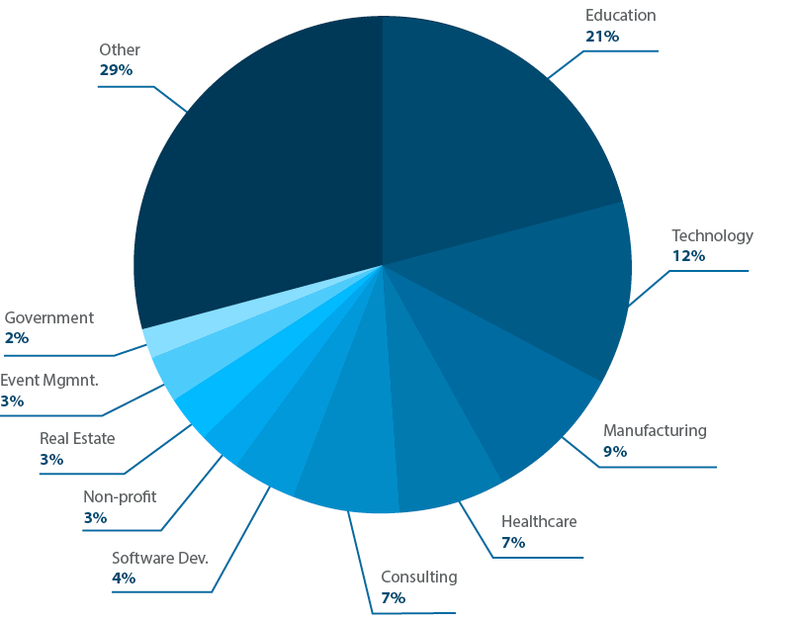 During their search for an LMS, the majority of buyers do quite a few software demos. 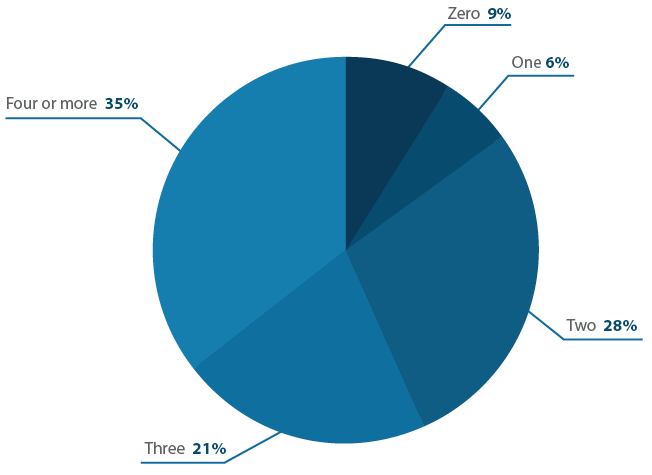 Contrary to previous business software purchasing data Capterra conducted that found the majority of software buyers do 0-1 demos before purchasing, Fully 57% of the LMS respondents did three or more software demos before making a purchase decision.Tweet Thisfully 57% of the LMS respondents did three or more software demos before making a purchase decision. Another 28% did two demos, and only 15% did a meager 0-1 demos. 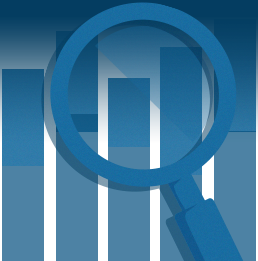 In comparison to other types of software purchasers, LMS buyers are more informed of their options and give greater due diligence to their software choice. 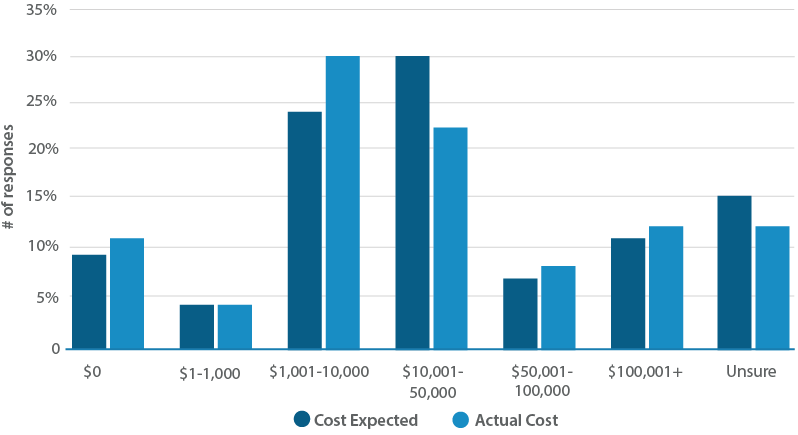 Despite all this research, however, people were still likely to lowball their expected costs, by an average of 59%. Most people ended up spending more than they planned to for their learning management system.Tweet ThisMost people ended up spending more than they planned to for their learning management system. Given this, prospective purchasers should multiply their expected total costs by 1.59 to get a more accurate estimate. Our respondents' expectations when searching for an LMS demonstrate just how hard it is to figure out, ahead of time, what complex software systems will cost you when everything is said and done, despite the existence of several LMS pricing guides and online pricing data. It's not until you get into the thousands of learners that you really need to worry about spending serious money. How did they purchase their LMS? 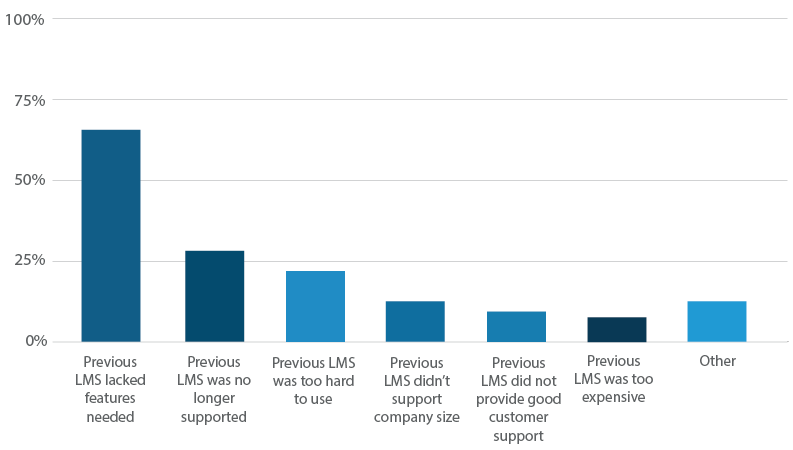 People's motivations for buying an LMS were varied. The most widely cited reason according to the LMS research was functionality, with price a close second, and support a distant third. A software product's popularity was dead last, indicating that heavily informed LMS buyers are less swayed by the market than by their own, unique needs. The length of the implementation process was similarly hard for many LMS users to predict ahead of time. Roughly 15% of people guessed the time it took to fully implement the learning management system would be shorter than it actually was. How do they use their LMS? Once they have their LMS, how do people actually use it? Of the roughly 80% of respondents representing the corporate/non-academic market for LMSs, Most respondants are using their learning management software for internal training and skills certification.Tweet Thismost are using their learning management software for internal training and skills certification. A smaller percentage of companies use their LMS for compliance and onboarding, and even fewer use their LMS for external purposes like training clients or selling courses to others. How long have you been using your current LMS? 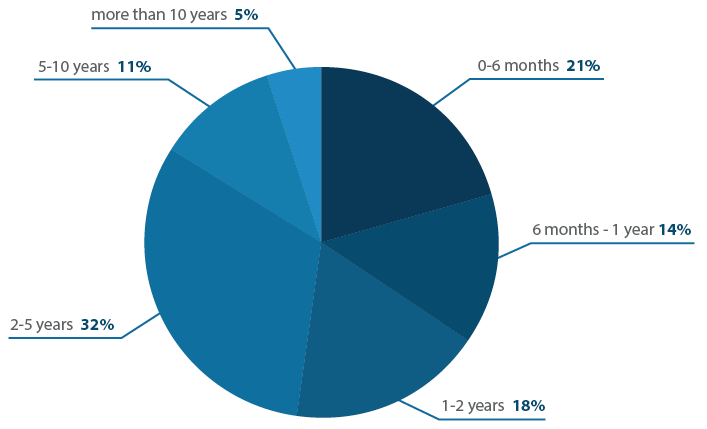 On average, organizations have been using their LMS for 2-4 years. 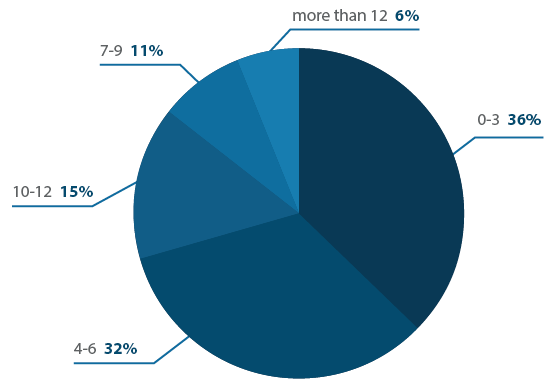 Almost half (49%) have been using their learning management system for two years or more, and 5% for over ten years. Because LMSs are such potentially big and complex purchases, it makes sense that organizations may be more likely to stay with their current provider for several years. The most-used LMS features include assessment and testing tools, blended learning, and student portal functionality.Tweet ThisThe top most-used LMS features include assessment and testing tools, blended learning, and student portal functionality. Features that people have but don't use include eCommerce, gamification, and Tin Can compliance. The most wanted feature that people don't yet have is video/ live conferencing, and we found people were most confused about Tin Can compliance, gamification, and extended enterprise portals. All three of these latter features are fairly new, which may explain the confusion. Even something like gamification can be hard to understand (is it gamification, or games-based-learning? Is it more than just badges and points? ), and that's with barrels of digital ink being spilled explaining it. For something even more abstract like Tin Can's “experience tracking” it's no wonder people are less sure of it. 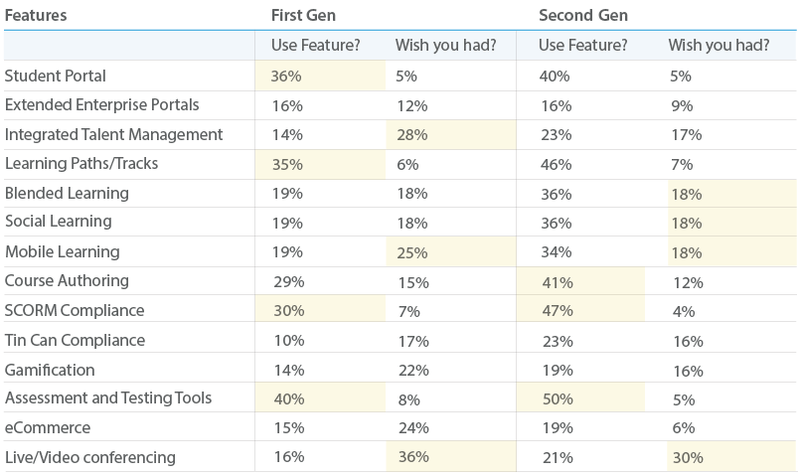 Second generation buyers were much more likely to use certain features, as opposed to those using their first LMS. How effective is their LMS? In general, people seem to be fairly happy with their learning management systems. How satisfied are you with your LMS? An impressive 63% of people were satisfied or very satisfied with their LMS.Tweet ThisAn impressive 63% of people were satisfied or very satisfied with their LMS. That said, over a quarter (26%) of people were dissatisfied or very dissatisfied with their current selection, indicating a fairly sizeable chunk of customers who may be interested in switching solutions or being better treated by their current software providers. Interestingly, people were not necessarily more satisfied with their LMS the more educated they were about the LMS market. Previous Capterra research identified the fact that software buyers in general become less satisfied with their software purchase the more demos they do. This seemingly paradoxical finding perhaps reflects the “curse of knowledge” as applied to the software purchasing process. Satisfaction rates were also affected by time. There seems to be a honeymoon period six months to a year after purchasing an LMS, which declines after the first year, and then rises slowly again. This might reflect a growing confidence with and understanding of the LMS as time goes on. It also means people are probably more likely to switch their LMS in the 1-5 year window when they are the most dissatisfied with it. Why are you unsatisfied with your current LMS? Of those who weren't satisfied with their current LMS, by far the biggest reason given was that they found it “lacking certain features.” This underscores the importance of coming up with a realistic and comprehensive list of requirements before deciding on a final solution. Surprisingly, cost was only an issue for a small percentage of people (11%) indicating If you get the right features and functionality, you'll be more willing to pay for a quality solution.Tweet Thisif you get the right features and functionality, you'll be more willing to pay for a quality solution. Which aspects of training were significantly impacted by the LMS? Academic organizations by-and-large appeared more optimistic about the effects of learning management systems on their success metrics, claiming significant impact on student satisfaction and course completion rate, and only slightly lower impact on teacher/administrative productivity. On the corporate side, trainers were most pessimistic about their LMS's effect on employee retention rate, while they saw the most impact on their total cost of training. Capterra's LMS research shows the impact of modern, and cloud-based learning management systems to reduce the cost of training, increase student satisfaction, and improve course completion rate. But users also show a significant amount of dissatisfaction with current LMS functionality, and a fairly large lack of education on just what an LMS will cost. Surprisingly, despite higher-than-expected costs for learning management systems, price was not the most important factor for most people in choosing or switching an LMS, and high perceived costs were almost nonexistent as a reason for dissatisfaction with a current system according to the LMS numbers. Capterra collected the data in this learning management systems report through a 26 question survey to LMS buyers and users online, conducted over the course of three months and receiving a total of 102 qualified responses.